Some of the participants at the Latin American preparatory event for the WCC's 9th Assembly. Federico Pagura, WCC president from Latin America: Churches must respond to contemporary challenges in prayer and hope. Brazilian churches actively participation in the "YES Campaign" on the eve of the national October 23 referendum. The objective, to ban the guns trade in the country. 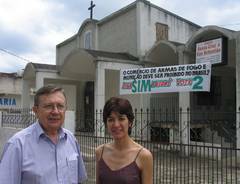 In the photo: Ervino Schmidt, executive secretary of the National Council of Christian Churches of Brazil and Christina Takatsu Winnischofer, secretary general of the Anglican Episcopal Church of Brazil. 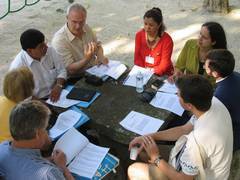 In small groups, participants at the event in Mendes shared Bible studies using the lectio divina tradition. 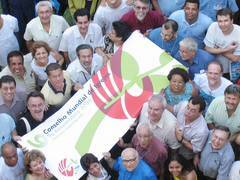 With a call "to pray, support and participate" in the forthcoming World Council of Churches (WCC) 9th Assembly in Porto Alegre next February, representatives from churches and ecumenical bodies in the region concluded a preparatory event that took place in Mendes, Brazil from October 16-18. The WCC's 9th Assembly "will, without a doubt, be a significant moment in the history of our journey in this continent," said the 60-some participants in a letter to region's churches. The letter invites churches to "pray, support and participate" in the Assembly. Moreover, it underlines the need to "encourage and motivate youth participation" as a "contribution to the construction of a new Latin American ecumenical movement" . Speaking for young people, Nicaraguan Ashley Hodgson, the Caribbean representative on the Latin American Council of Churches' Youth Pastoral Commission, said that "young people are prepared and willing to make a contribution" . 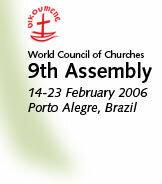 "When we proposed that the 9th Assembly be held in Porto Alegre, we did so because we see a laboratory of something new developing there, a laboratory of hope," said Bishop Emeritus Federico Pagura, WCC president from Latin America. "In Porto Alegre, the cradle of the World Social Forum, we will hear the challenge from social movements: 'Do you also believe that another world is possible, is necessary, urgent, indispensable?'" The Assembly will be an opportunity to "seek an answer in prayer and hope". Participants at the preparatory meeting reflected on the contribution that churches from the region can make to the Assembly. "There is a lot we can contribute," affirmed Nelida Ritchie, bishop of the Evangelical Methodist Church of Argentina. For example, the "unavoidable need to anchor the search for Christian unity in the search for justice" . Or the "impulse to broaden the ecumenical space beyond those who confess Christ". Ritchie proposed "moving beyond what is politically correct and speaking from the heart, from the experiences of suffering but also the dignified resistance," of the churches in the region. "As Latin Americans, we should not expect to impact the Assembly in terms of numbers, because we don't have them, but let's do it working from around the edges," she suggested. Participants discussed the Assembly agenda and procedures, in particular consensus decision-making. 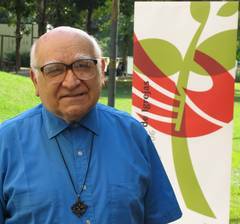 Cuban Presbyterian pastor Héctor Méndez, a WCC central committee member, underscored the benefits of the new model, and emphasized that as it was only recently adopted, it is still being tested. Meeting in the week prior to a national referendum about banning the guns trade in Brazil, participants manifested their decisive support "for the churches' YES to life and NO to the guns trade campaign". In their message, participants reviewed the "concerns, hopes and dreams" identified at the event. "We recognize our failures and limitations as churches" in the face of major current challenges, but are open to the "transforming action of God in our lives, in our churches and throughout our world," they said.